It's been awhile since we had a "Peanut" lunch, with Peanut being what the boy called all elephants when he was a toddler. But there's always time for a quick elephant lunch. It's cute, it's simple, and what isn't there to love about elephants? In this lunch, we have a turkey and cheese sandwich on honey wheat bread, cut into elephants using one of the Lunch Punch cutters. While you can cut the entire sandwich at once, I find the detail shows better if you do it piece by piece. A couple of sugar eyes help accentuate the elephant design. Underneath the sandwiches, there is a s'mores granola bar and to the left, we added blackberries (with an elephant pick of course) and some mini chocolate chip cookies. Since this is a lunch for my boy, there were likely a ton of extra snacks in his lunch bag because he is starving. Lunch is packed in one of our EasyLunchboxes. 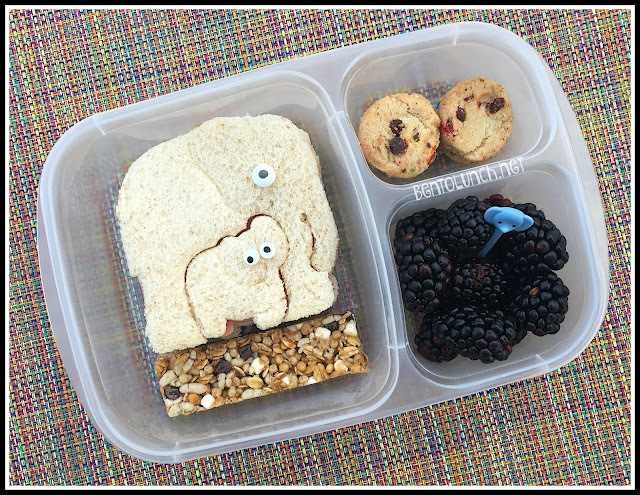 The elephant sandwiches were created using the Lunch Punch Animal Shapes cutters.